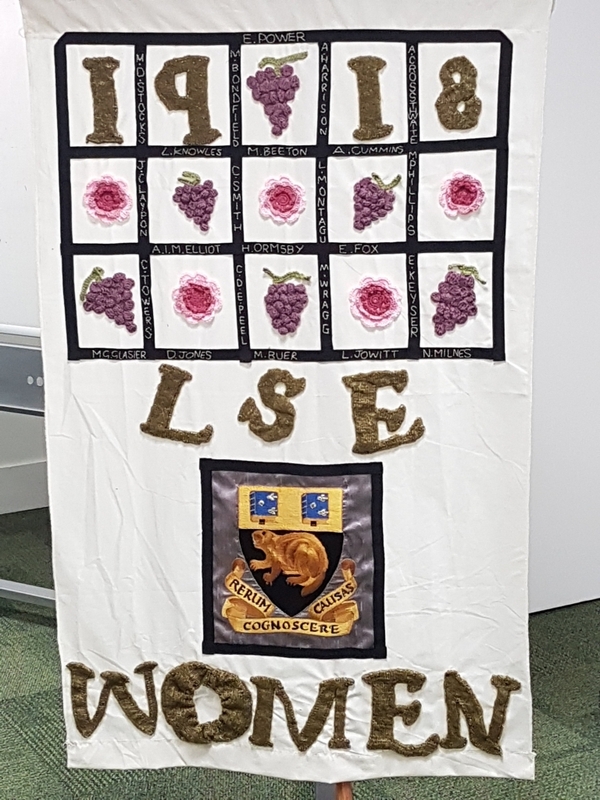 The LSE Women 1918 banner is inspired by both the buildings and people of the School. The embroidered version of the School’s coat of arms was produced some years ago by the Department Manager in Economic History, Joan Lynas. Joan was known for her embroidery and often produced these pieces as retirement presents. The top of the banner reflects the Portugal Street entrance to the Old Building, where you enter beneath an arch decorated with a trellis pattern of roses and grapes. In 1918 this door was the entrance to the Smith Memorial Hall, used as a centre for boy’s clubs and other community groups. It became part of LSE in 1935. The trellis is embroidered with the names of 24 women who taught at LSE in 1918. They are a mix of regular and occasional lecturers although at least one of the occasional lecturers in 1918 was later a full member of staff. Occasional teachers usually provided a single course of lectures in a year – but many were associated with the School for many years. They include names well known at LSE and also the wider world as well as the names of teachers now long forgotten – it feels good to remember their role despite their anonymity. Occasional Lecturer in Social Science and Administration, formerly a student at Cambridge University. Occasional Lecturer in Social Science and Administration. In January 1924 she became the first woman minister in Britain as Minister for Labour in the first Labour government. Assistant Lecturer in Economics 1912-1915 and 1917-1918, after gaining a first class BSc (Econ) in Economic History and DSc (Econ) 1927 at the School. She went on to teach economics at the University of Reading. Occasional Lecturer in Social Science and Administration. Janet was an epidemiologist with the Local Medical Board and later worked at the Ministry of Health. Tutor in the Social Science and Administration Department. Agnes also studied for Social Science Certificate, Diploma in Sociology and Mental Health Certificate in the same department. She went on to be a tutor in Economics and Psychology at King’s College and at University College Hospital. Occasional Lecturer in Social Science and Administration. Anne was the Lady Almoner to St Thomas’ Hospital and the Northcote Trust where she was influential in developing care for out-patients. Occasional Lecturer in Social Science and Administration, associated with Southwark Health Society. Occasional Lecturer in Social Science and Administration. Evelyn studied history at Somerville College Oxford and trained at the Women’s university Settlement in Southwark. She became a mental health worker involved in founding the Central Association for the Mentally Defective, later known as the National Association for Mental Health. Tutor in Social Science and Administration, after completing her Social Science Certificate, Diploma in Sociology and BSc (Econ), specialising in Economics. Assistant Lecturer in Social Science and Administration. Agatha held the first academic post in UK dealing with industrial welfare. In later life she worked for the Indian Conciliation Group and worked with Gandhi on Indian independence. Assistant Lecturer in Social Science and Administration, after completing the Social Science Certificate. Occasional Lecturer in Social Science and Administration. Dorothy had previously studied at the University of Manchester. Assistant Lecturer in in Social Science and Administration. She studied at Somerville College. An active Quaker, Lettice Jowitt served as warden of Bensham Grove Educational Settlement, Gateshead helping to set up the first mother and baby clinic and nursery school in the area. During the Second World War she worked in refugee camp in Africa. Reader in Economic History. After studying at Girton College, Cambridge Lilian Knowles was among the first recipients of an LSE research studentship in 1896. In 1921 she became Professor of Economic History – the first woman professor at LSE. Assistant Lecturer in Social Science and Administration. In 1918 she moved on to Edinburgh where she was Director of the School of Social Study and Training until 1951 and a founder of the British Federation of Social Workers. Occasional Lecturer in Social Science and Administration. 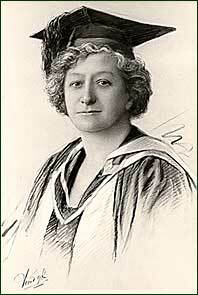 A founder of Jewish League for Woman Suffrage, she helped found the World Union for Progressive Judaism. Assistant Lecturer in Geography. Hilda Ormsby had studied for the Geography Certificate and BSc (Econ) before receiving her doctorate in 1931. She became Reader in Geography at the University of London. Occasional Lecturer in economics. A journalist and writer on household management, along with Maud Pember Reeves, she was Co-Director of the women’s service for the Ministry of Food. Occasional Lecturer in Public Administration and Social Science and Administration. She had obtained her doctorate at LSE in 1908 and was the first Labour Party woman organiser. She worked with Beatrice Webb on the Royal Commission on the Poor Law and was elected MP for Sunderland in 1929. Eileen studied history at Girton College Cambridge and in 1917 was an occasional lecturer in Economic History. She was appointed to a lectureship in 1921 and readership in 1924, becoming LSE’s second woman professor in 1931. Assistant Lecturer in History. Mary obtained a first class degree in Economic History in 1913. She was later a lecturer in Economics at King’s College for Women and an extra mural tutor at University of Manchester. In 1939 she became Principal of Westfield College, London. Occasional Lecturer in Social Science and Administration. Constance attended King’s College London and was Joint-Secretary of the Women’s Employment Committee (1917–1919), and Deputy Chief Inspector of Factories (1921–1925). She was awarded an OBE for her services to social work. Occasional Lecturer in Social Science and Administration. It would be great to find out more about her life and career. Occasional Lecturer in Social Science and Administration. Muriel ran the Woolwich Mission Kindergarten, later working in Hoxton. The banner will be on display in LSE Library during summer term 2018.